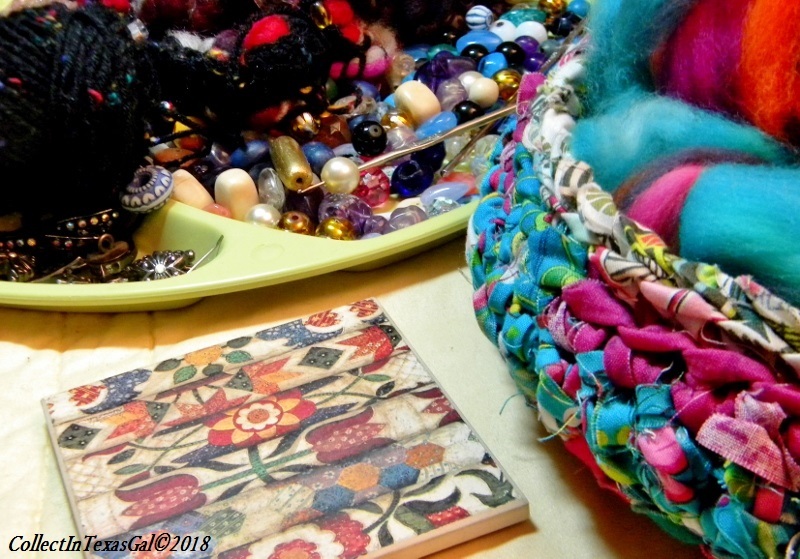 Fiddly-fiber-dee! 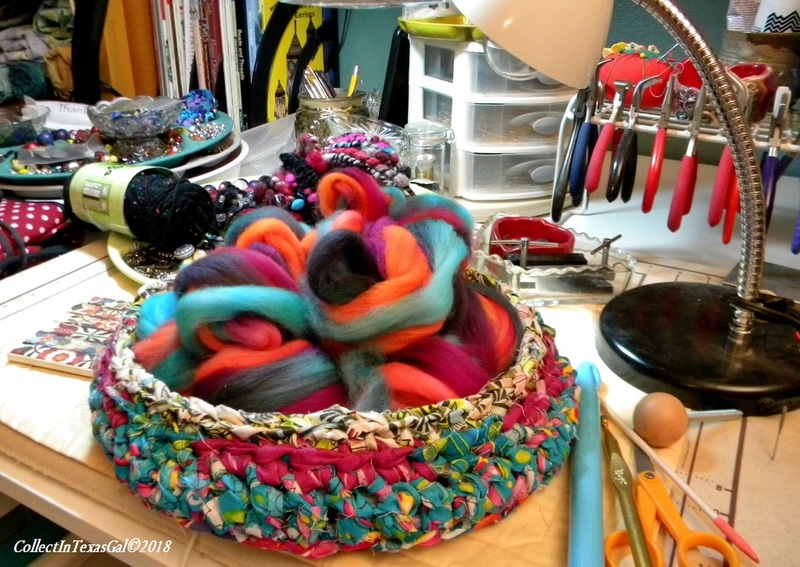 That's my Scarlet O'Hara exclamation for what my once Jewelry Table...now Spinning-Fiber-Jewelry space has become....crowded, stacked and organized. Yep, I know right where everything is and within reach...until it gets covered up. Then it's out of sight out of mind...happens to scissors all the time. Oh, and it's also a bar...mostly a coffee bar, and I guess with the quilt designed coaster, I'll have to add Quilt Stuff to the already 'OverDoSue' Table. Let's talk about the basket full of rolled wool. I made it several years ago in my crochet rag rug revival and somehow it never got embellished with buttons and other finishing things. I found it last night on a bottom shelf stacked with other UFO rag rug baskets, and decided it perfect for holding the split and drafted rolls of mohair roving. Aren't these colors yummy? Roving comes in a roll about 3 inches around which for me as a beginner is to big to pull apart (draft) while spinning. After several hours of U-Tube watching, I learned about fluffing up the big roll and splitting it into smaller rolls. Next step is to pre-draft the strips...pull the fibers to thin without pulling apart...then roll up loosely.